64 – Who is “G” & why does he deserve a power wheelchair? 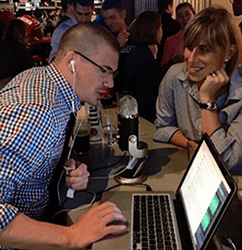 In this episode of the PT Pintcast, host Jimmy McKay talked with Marymount University Neuro Anatomy professor (and Marymount PT alumnae) Kelly Negley PT, DPT, NCS and fellow 3rd year Marymount DPT student Shannon Dooley. Kelly and Shannon shared their experiences from the Marymount University service learning trip to Costa Rica, insights into wheelchair seating and mobility needs and all three discuss their interactions with one special patient, “G”. Why does “G” deserve a power wheelchair?